The relationship between Christianity, freedom, and capitalism has been a subject of scholarly study for centuries. 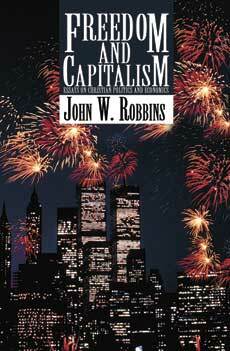 In this volume, John Robbins argues that political and economic freedom are the results of Biblical Christianity. Political freedom and capitalism arose in Northwestern Europe and North America after the Christian Reformation of the 16th Century, and they are unique in world history. The nations and peoples that heard and accepted the Gospel of Jesus Christ as proclaimed by the Reformers quickly became free and prosperous on a scale previously unimaginable. Some historians and economists have denied any causal connection between Christianity, freedom, and capitalism, but they are able to deny this connection only by ignoring clear philosophical, economic, legal, sociological, and historical evidence demonstrating that Christianity is the source of capitalism. Laissez-faire capitalism, which is the only moral economic system, is in fact the economic system of Christianity. This is the topic for the 2008 Worldview Essay Contest. Dr John W. Robbins attended Grove City College (A.B. 1969) and The Johns Hopkins University (M.A. 1970, Ph.D. 1973). He has served as chief of staff for a Member of Congress, editor of The Freeman magazine, Economist for The Heritage Foundation, and Professor of Political Philosophy in The Freedom School. Is Christianity Tied to Any Political or Economic System?